COMPACT & VERSATILE A FULLY AUTOMATED SOLUTION A fully automated, highly integrated compact analyser. 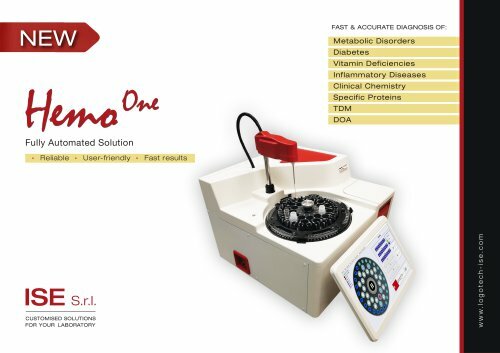 Specially designed for small to mid-sized laboratories, doctor offices, specific hospital settings, (rural) labs. Easy to operate menu for fast startup and minimum down time. Disposable reaction cells. Minimum maintenance required. Very cost effective and precise. Fully developed and made in Italy. Positive identification of reagents gives the end user the assurance to work without compromises on quality. Twenty-eight parameters for enzymes and substrates, with application on serum, plasma and urine, based on the most advanced research in clinical chemistry following international recommendations (IFCC). Twenty-eight parameters for specific protein, with application on serum, plasma and urine standardized with 5-point calibration curve.